Hello everybody, first time poster here! I was wondering if the IDW hardbacks were ending after volume 8 as we haven't had any information on further volumes yet? Previously we've known at least the cover art a couple of volumes ahead of times, but I can't find anything for volume 9 anywhere. Thanks, you're probably right but it does seem that information is coming out slower recently - I'm sure we saw the Bebop & Rocksteady cover for volume 8 before volume 6 even released for sale. That being said using Nines chronology thread on here, I've got a rough idea of which issues will be in the next few volumes depending on how many they squeeze into each book. Well, you're not wrong. We had preorders for 7 and 8 right before 6 was available for purchase, IIRC. I figure there's no call for irritation or alarm until we're able to buy 8 and STILL haven't seen hide nor hair of 9. It looks like the Donatello Macro has been postponed to next Wednesday? So we'd have that on the 3rd of October, and then the Ongoing and Michelangelo on the 31st. Also, a thought on the pace with the 50-100 mega arch. While I can see some logic for Bishop to possibly come back again at some point, there's also some sense to the end of Battle Lines (or the Raphael macro) to shelve Bishop for a while. Last edited by Utrommaniac; 09-26-2018 at 04:23 AM. It's possible Raph might end up killing Bishop in his macro, and that would mark the turning point for his character. Or... I have seen some sketches of Alopex for that issue. Maybe Raph wants to kill him but she talks him down from it. She has had to kill in the past so she would know what he's going through. Sure. And then Maligna, right? I'm thinking Maligna would just be another "minor" force to deal with, unless they swarm Dimension X so much that they start pushing into Earth's dimension. Which could be a possibility. Gee, Zenter, maybe it was a bad idea to topple the Utrom Empire and remove the only thing keeping something even more dangerous away. Concerning the Triceratons, is it possible other extinct species have persevered as mutants? For example, the thylacine? The use of human-born mutants makes mutants of recent extinctions (such as the aforementioned thylacine) easier. I would say it's unlikely. Since the Utroms were the only ones messing with mutation until Hob and Shredder got a hold of the ooze. And when they were, it was for the purpose of creating soldiers...out of the most dangerous animals of their time. Since Krang kept a mostly iron hold on what little ooze was left, he probably didn't have a lot of interest in mutating other things until he discovered Leatherhead...and then abandoned his mutation plans. Putting Bishop away for awhile? His story hasn't unfolded yet and outside of one (now two) arcs he has hardly made an impact. 50-100 has been mostly about worldbuilding and less about a focused, single villain story like 1-50 was with Krang and Shredder. 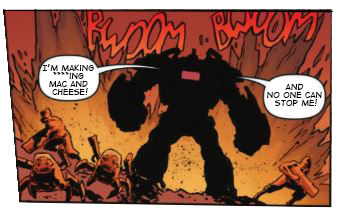 I think IDW is saving Bishop's endgame for post-100. 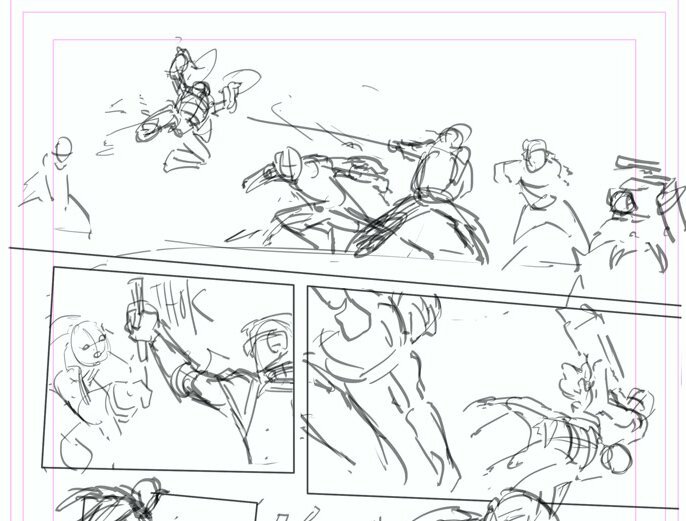 Sneak peek at @DaveWachter's layouts for #TMNT #88. Now... let's do the math: what is 88 minus 44? 44, right? And wasn't #44 a significant issue in @IDWPublishing #TMNT history? Well, fans, retailers & collectors, take my advice... you don't want to miss #88. Hint, hint... HINT! Sounds plausible, however if all of the macro issues are set after this then I doubt there will be any lasting injuries to the degree that Leo (arm) and Raph (face) had in the Image comics, as the by lines don't really indicate as such - although to be fair we have had Robo-Donnie already. The Donatello Macro takes place before this arc for sure - since he was at Harold's lab at the beginning. Michelangelo's might take place before there too, since he was already bonded with the kids at the Foot Clan and was afraid of them being manipulated by Splinter. The next two probably will, since Raph has a story about being captured by the EPF and Leo is taking a break in Northhampton. But yeah, you're right that the turtles wouldn't be sustaining any major injuries. Except maybe Raphael, but we'll find out soon enough about that. Perhaps it involves Metalhead seeking revenge against B&R. You're probably joking, but still unlikely. Since BB&RS and Metalhead wouldn't be at least a little involved. The only metal head we have to worry about is Bishop and his backstory. Which...may just be what Tom is referring to. Hmm, I hadn't thought of that, although splitting them into two pairs of stories would be better pacing for the overall ongoing chronology. That said it would be nice to get some sort confirmed running order for the issues since Universe started, Nines list is great but the last couple of year's worth has been based on educated guesses - also didn't the early micros have notes on the inside of the cover stating their placement relating to the main ongoing series? I may be mis-remembering, but we definitely have no notes like that these days. Yeah I am thinking that Slash could not make it out of this one guys. Slash has been so boring and one dimensional since he's been mind controlled (obviously, he has no personality anymore), that I wouldn't care if he goes.